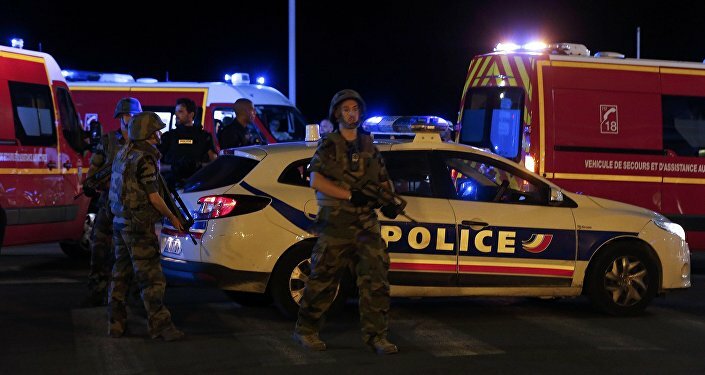 It was a typically fine evening on July 14, 2016, with thousands of revelers enjoying festivities on the Promenade des Anglais — but as the final sparks of the city's time-honored fireworks display died away at around 10:30pm, the crowd's communal elation was shattered by the abrupt arrival of a 19-ton cargo truck, driven by Mohamed Lahouaiej-Bouhlel, a Tunisian national. 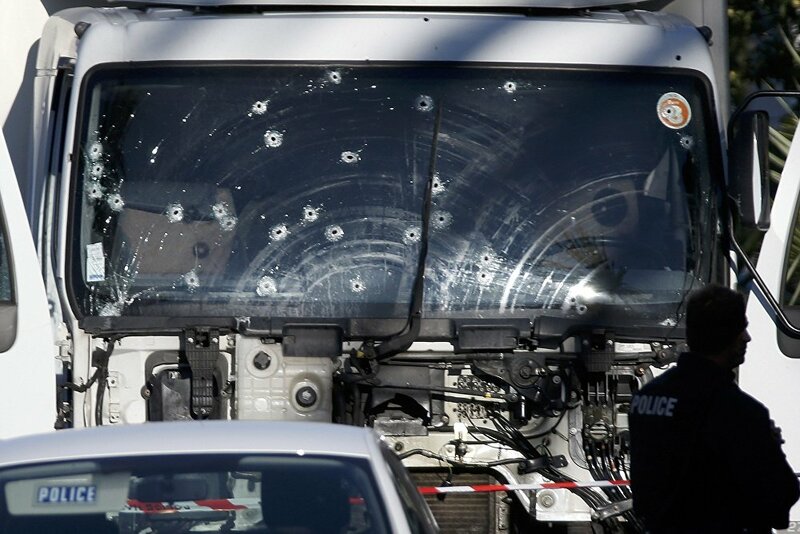 Bullet imacts are seen on the heavy truck the day after it ran into a crowd at high speed killing scores celebrating the Bastille Day July 14 national holiday on the Promenade des Anglais in Nice, France, July 15, 2016. The truck cannoned into the throng at a speed of 90 kilometers per hour, crushing everything in its path. Heroic attempts by members of the public to halt the attack and wrest control of the truck from Lahouaiej-Bouhlel were unsuccessful — after traveling almost a full kilometer, killing and maiming every step of the way, the onslaught was finally stopped when police shot and killed the attacker. In all, 86 were killed, and 458 injured in a mere five minutes. 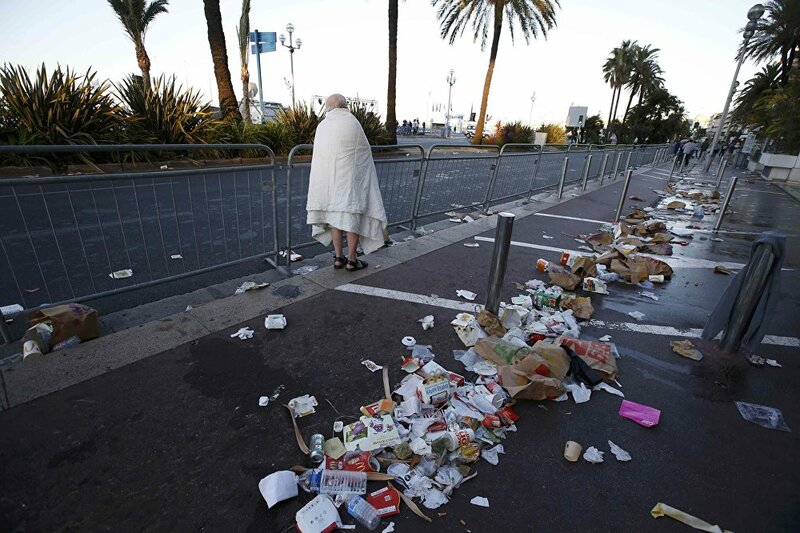 A man walks through debris scatterd on the street the day after a truck ran into a crowd at high speed killing scores celebrating the Bastille Day July 14 national holiday on the Promenade des Anglais in Nice, France, July 15, 2016. Daesh were quick to claim responsibility for the attack, saying Lahouaiej-Bouhlel had answered its "calls to target citizens of coalition nations that fight the Islamic State." Then-President François Hollande announced an extension of the state of emergency, declared following the November 2015 Paris attacks, for a further three months — and intensified French airstrikes on Daesh in Syria and Iraq. Thousands of extra police and soldiers were deployed to the streets, where they remain to this day — and the government called on citizens to join national reserve forces, an entreaty many answered. Authorities publicly remain in the dark as to what prompted Lahouaiej-Bouhlel to carry out the attack. Searches of his home, mobile phone and laptop have yielded no evidence of a direct connection between him and Daesh, so authorities are operating on the assumption he was self-radicalized. In 2014, slain former spokesperson for the group, Mohammed al-Adnani, encouraged supporters to carry out attacks in Europe using a variety of weapons, including vehicles. Nine suspects remain under investigation on suspicion of aiding in the attack. To commemorate the tragedy, President Emmanuel Macron will head to the city, France's fifth most populous, with US President Donald Trump. Fireworks won't be erupting this year — instead, a mass will be held, and an evening concert will honor the fallen. Despite understandable fears of another strike, turnout is expected to be high — and it will likely be the first time some attendees have returned to the Promenade since that fateful night. However, many victims won't be attending at all — to protest the sluggish approach to compensation taken by authorities. In the wake of the incident, US$342 million was earmarked for victim relief, with those affected by the attack prompted to apply for a stipend not long after the attacks. While all applicants were given an advance payment, ranging between US$2,500 — US$5,000, few have received further funds, with only around US$25 million paid out as of July 2017. A woman reacts near flowers and flags placed in tribute to victims, two days after an attack by the driver of a heavy truck who ran into a crowd on Bastille Day killing scores and injuring as many on the Promenade des Anglais, in Nice, France, July 16, 2016. Furthermore, not long after his May election win, Macron abolished a government department created in February 2016 to provide support to victims of terrorist attacks, a move FENVAC (the National Federation of Victims of Attacks and Collective Accidents), an organization representing the victims, described as "absurd." "We [are] in an absurd situation when we had a device that worked and which had the unanimous support of the victims. These families need to be reassured and in Nice, we are beyond a problem of rights and compensation, we are facing a public health problem," said Stephane Gicquel of the Federation. FENVAC states that while most of those injured in the attack have now physically recovered, some have lasting damage from their wounds — around 20 casualties remain in treatment. Moreover, around 3,000 witnesses to the attack are still in psychiatric treatment, among them many children, suffering from sleep disorders and panic attacks. A soldier secures the Promenade des Anglais in Nice, southern France, Monday, July 18, 2016, prior to a minute of silence to honor the victims of the Bastille Day attack on Thursday in Nice. The issue of compensation is a vital one, as the attack did not merely deleteriously impact the mental and physical health of victims and witnesses — many have suffered in respect of education, housing and employment, and find themselves embarrassed financially as a result. Some have been unable to return to their jobs, others forced to postpone or stop their studies outright. While victims receive free medical care, few French doctors are trauma-trained — and the provision is scheduled to end in November.